The Nucleus-M is a wireless 3 Channel system. Connections between the FIZ hand unit and the two hand grips to the motors are completely wireless. Each motor has a built-in MDR unit, saving space and setup time. A single motor can be powered directly from the camera’s battery though a 7-Pin to P-TAP cable then daisy chained via 7-Pin to 7-Pin cable to run additional motors. There is no limit on the amount of motors an operator can attach per channel. The FIZ hand unit and two handle grips have a wireless range of 1000 feet. The signal from the FIZ hand unit can be upgraded to 1 1/4 miles with an additional accessory. When fully charged the batteries in the hand grips can last up to 2 days. The batteries in the FIZ unit can last up to 10 hours. FIZ hand unit is capable of controlling 3 channels – focus, zoom, and iris as well as overriding the hand grips. Motors can calibrate on lenses without hard stops – such as photo-lens with follow focus gears. Motors fit standard 15mm and 19mm Rods. 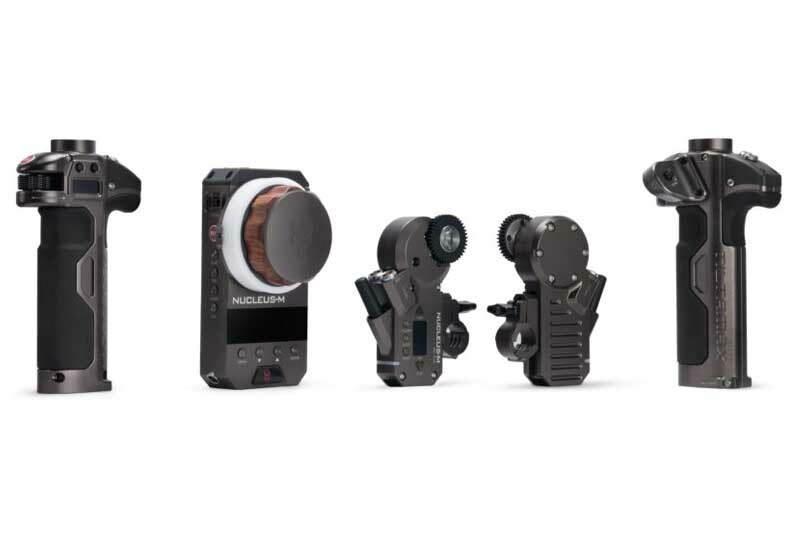 Ideal for Gimbal, Drone, and Shoulder-mounted setups.